You are here: Home / Community & News / Use it or lose it – fact or fiction? Are the common physical changes seen with ageing a true reflection of the inevitable ageing process or do they reflect muscle disuse? Think of ageing. More than likely you think of becoming frail, weak, and losing your independence. If you’re honest, you’re probably picturing a cringe worthy body with a bony frame almost poking through the wrinkly skin. It’s not pretty, it’s not healthy and you’d probably feel sorry for this person. My guess is you’re thinking to yourself ‘I don’t want to get like that when I’m older’. What if you didn’t have to? What if you could be fit, strong and retain your youthful looks by doing one simple thing? And without spending thousands of dollars on plastic surgery. Sounds sweet right? You think maybe we’ve discovered a magic pill that can fight off ageing? If only. When we imagine someone who is fit, strong and muscly, the chances are we picture someone in their 20’s or 30’s. Maybe Chris Hemsworth as Thor? But what if you saw someone in their 60’s or 70’s or even 80’s who was also fit, strong and muscly? Would you assume they are just genetically blessed? What if I said you could be that person and it’s as simple as exercising? I know, as soon as I mentioned exercising you probably stared to groan, roll your eyes and you probably already feel exhausted. When it comes to exercise it’s easy to lose interest and think ‘screw it I’ll put up with getting old and weak’. Exercise takes energy. It’s hard work and it makes you sweaty and gross. It’s hard enough to find the motivation to get started, let alone the time. There is a lot not to like. Let’s admit it the thought of exercise puts us out of our comfort zone and it feels more like a foe than a friend. Instead we’d much rather eat ice cream while we find out who wins The Honey Badger’s heart. I know I would. And yes it makes me feel guilty and lazy, but hey it’s comfortable. But we’re adults. We know we’re not going to achieve anything without putting in the work. It’s not like Steve Jobs or Elon Musk strolled effortlessly into their success. And Hemsworth didn’t get to be Thor over night by simply popping a pill. What you put in is what you will get out. Muhammad Ali hated training but said to himself ‘Don’t quit. Suffer now and live the rest of your life as a champion’. We can all live our lives as champions if we are willing to go through the hard work and face the obstacles. We get told again and again that exercise has huge health benefits, like reducing the risk of diabetes, heart disease and arthritis pain. The list goes on. We know it can improve your psychological health, decrease obesity rates, improve muscle strength and endurance, improve balance and mobility and so much more. What is less commonly known is we can lose more than 8% of our muscle mass by the time we reach our 40-50’s and more than 15% each decade after the age of 75. Elderly patients with low muscle mass are 3 to 4 times more likely to report a disability, have balance issues and/or use a walking aid. Weaker thigh muscles can be linked to a higher fat content in the muscles, a decreased ability to activate the muscles and a reduction in muscle metabolism. While it’s commonly believed to be an inevitable decline from musculoskeletal ageing, these deteriorations can actually be more associated with a sedentary lifestyle and poor nutrition. (Wroblewski et al 2011). We all want our parents and grandparents to be strong and healthy. We don’t want them to lose their health or their independence. We’ll take them to regular GP check-ups and make sure they take their medicines and supplements to stay on track. Maybe we’ll encourage them to sit outside or take a walk for fresh air and sunlight. But very rarely would we encourage them to do some strength and resistance exercises. Think of your grandparents doing strengthening exercises. You’re probably thinking ‘they just couldn’t, their too old and frail’ or ‘they’ll break a hip’. Maybe you think they could do a low intensity seated exercise group or water aerobics? My guess is you’d never picture them ripped and toned with bigger muscles then you. You probably wouldn’t even think it’s possible. Wroblewski et al (2011) looked at whether or not long term exercise can stop the loss of muscle mass and strength, which is commonly seen in the ageing sedentary population. He looked at masters athletes between the ages of 40-81 and found that lean muscle mass and mid-thigh total muscle area was not significantly different across each decade of age. He also found across all these age groups there was no significant difference in subcutaneous adipose tissue (fat that is sitting underneath the skin) and intramuscular adipose tissue (fat found in the muscles) (see Figure 1). 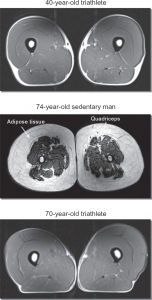 Figure 1 shows the comparison of the quadriceps in a 40 year old triathlete, 74 year old sedentary man and a 70 year old triathlete and the results are amazing! In the triathletes the muscles are clearly well defined (dark grey areas), with minimal amounts of fat (whiter coloured areas). In the sedentary man there’s probably more fat than there is muscle and the quality of the muscles are nowhere near as smooth. Wroblewski concluded that chronic disuse of muscles plays a large part in the reduced strength and muscle mass associated with the cliché decline in physical function, increased falls and loss of mobility and independence. You can’t choose whether or not you age. But the simple lifestyle choice to become or remain active as you do age, can have a great positive impact on your physical and emotional health. It’s not too late, either. Short term resistance/strength training started in the later decades of life still shows increased strength in the ageing muscle and then long term exercise is able to maintain the muscle strength and integrity. So are you willing to become a champion of health and wellness, even into your 70’s and 80’s? If all it takes is to push through the discomfort and horrid thought of some daily exercise? Or would you rather become sluggish couch potatoes who may eventually lose your muscle strength and your independence? So say goodbye to that wrinkly skinned picture and start embracing in the thought of becoming a champion of health and wellness in your later years of life. Pick up some weights today! Remember, if you don’t use it, you lose it!